Sean Cavanagh and Colm Cavanagh of Cavanagh Kelly, team sponsor to St. Patrick's Academy, Dungannon called in to present the team with Murphy's Gloves ahead of Tuesday's MacRory Cup final against St. Patrick's Cavan. The young sporting students of St Patrick’s Academy, Dungannon have date with destiny tomorrow, as they take on St Patrick’s College, Cavan in the show-piece event of Ulster Colleges football, the MacRory Cup final. The Academy captain, Fintan McClure, has led the Academy attack from full forward all year. Currently in his final year, the Clonoe teenager insists the bond as friends and classmates is a motivating force to win. “To play with your club with the boys that live round you is great, but you’ve been going to school every day with these boys for six or seven years,” he told the Times. McClure points to the success of the junior year as augmenting the team. “The majority of the team is lower sixth. The starting team is made up of nine year 13s and six year 14s,” he said. Half back Liam Rafferty is one of Galbally Pearses’ players on the panel. 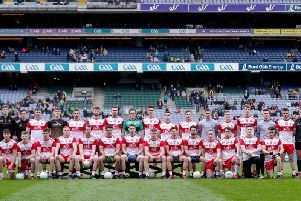 A Tyrone minor this year, both he and fellow wing back Michael McKernan’s roving runs forward have been a key feature of the Academy’s play. Rafferty says he and his team-mates have been careful not to get caught up in the hype of the game. At six foot six, towering midfielder Brian Kennedy is one of many physically imposing players on what is one of the biggest Academy panels in memory. The Derrylaughan man is also adamant about staying focused on the task at hand, despite the grand scale of the game. “We’re trying not to think about that too much, but you’ll soon know about it when you run out on the field,” he said. The Academy management team of Peter Herron and Ciaran Gourley have had considerable MacRory success in the past decade. Both men were at the helm when the school won back to back titles in 2008 and 2009, a feat not achieved since St. Patrick’s College Maghera in 1996 and 1997. Herron has of course been at the helm of each winning team since the school’s first title in 1991. “Mr Gourley is maybe more quiet and he’s more tactical, while Mr Herron is sort of old-fashioned, and he really motivates you,” said Liam Rafferty. Cormac O’Hagan, the young Coalisland sharpshooter, admits to feeling some pressure. Son of Fianna great Damian, his elder brother Tiarnan was part of the school’s Hogan Cup success in 2008, and Jarlath picked up a MacRory medal in 2009. “There’s a lot of added pressure on me anyway, especially from them,” Cormac said. “First of all when I was fourth year playing Brock Cup, both my brothers Tiarnan and Jarlath had won that before, so people were telling me about that at the time. I haven’t really got away from it and now, it’s all about MacRory,” he joked. He will be hoping he can make it a hat trick of MacRory Cup medals in the O’Hagan household on St Patrick’s Day.